The CGIAR Research Program on Policies, Institutions and Markets (PIM), supported by the United States Agency for International Development (USAID), and Cornell University are calling for concept proposals for the Structural Transformation of African Agriculture and Rural Spaces (STAARS) Fellows program. The STAARS project is a collaboration between Cornell University and the African Development Bank (AfDB) to advance in-depth, rigorous, policy-oriented research on the causal determinants of productivity and income growth, asset accumulation, rural employment and risk management in African agriculture and rural spaces. PIM has established a collaboration agreement with Cornell University to provide technical mentorship and support for selected early career African researchers. 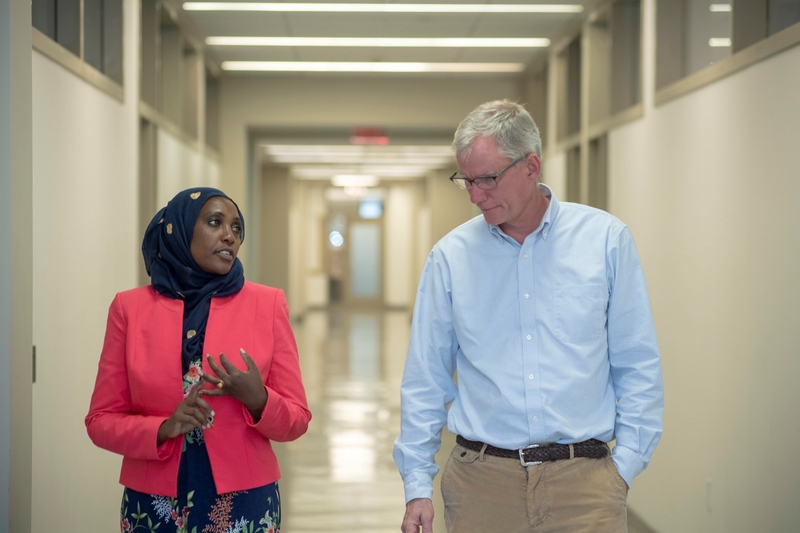 STAARS Fellow Mumina Shibia (left) with her mentor John McPeak, professor of public administration and international affairs at Syracuse University. STAARS fellows will be selected through this competitive call for proposals. Once selected, STAARS fellows will be paired with mentors at Cornell University with whom they will jointly author a paper on a topic of mutual interest relating to structural transformation in sub-Saharan Africa. PIM will support the publication of resulting research findings in high quality journals and as working papers. In addition, PIM and Cornell will facilitate fellows’ participation in scientific and policy conferences. "Locus of Control and Technology Adoption in Africa: Evidence from Ethiopia." Kibrom A. Abay, Garrick Blalock, Guush Berhane. "Do Safety Net Transfers Improve Diets and Reduce Undernutrition? Evidence from Rural Ethiopia"” Tagel Gebrehiwot, Carolina Castilla. The 2019 STAARS application process is now closed. We expect to release another call for proposals in early 2020. Please check back for updates. From left to right: Joanna Upton, Soumaila Gansonre, Chris Barrett, Liz Bageant, Garrick Blalock, Mumina Shibia (front), Brian Dillon (back) Margaret Jodlowski, John McPeak, Colleta Gandidzanwa, Khadijat Busola.